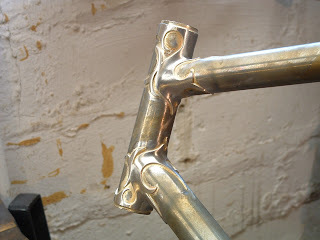 Just a couple shots of the lugs for my new road frame. 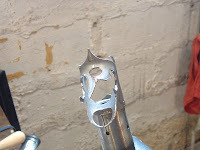 I decided to try out a set of Kirk Pacenti's "Slant Six" lugs, which I cut back a fair bit. 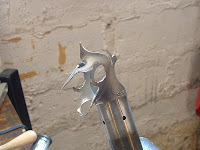 I'm also hoping to get my new Ellis dropouts from the laser cutter in the next few days as well. I'll post pictures of them as soon as they get here. 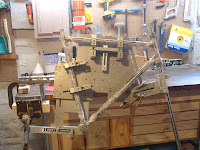 Frame #2 is ready for paint. Here's some shots of the highlights. 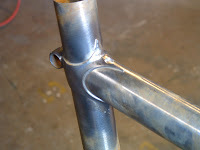 Here's the stainless lugs tacked up and ready to remove from the fixture. I kinda rigged up the fixture with the bar off my alignment plate. This way I can set the whole frame up at once and be done. 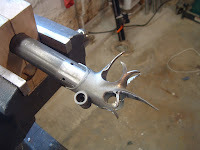 Talked to Don at Anvil, he said the new fixture should be shipping this week. Lisa wasn't home when I brazed this one so I don't have any pictures with fire in them, but here's some from when the smoke cleared. Pretty clean, not too much charred flux. The whole frame from the front. 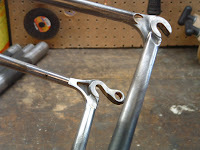 Didn't have the dropouts yet, so no chain stays. Here we are after a quick soak in the bathtub. Yes honey I cleaned all the flux out! Finally, after some quality time with the file and emery. 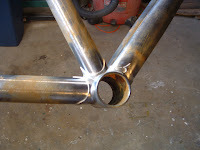 The head tube, would look a little nicer if I had a sandblaster to knock down the flashing, but once it's polished and painted you'll never know. 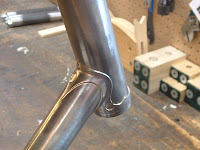 Things are moving along at Ellis Cycles. 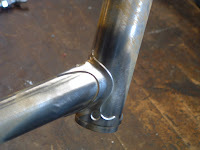 The current project is a fixed gear road frame with fancy stainless lugs. I tried to take photos through all the stages, but I must admit, I find it hard to stop and take photos once I'm in the groove of carving. 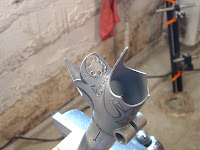 The seat lug begins with some 1/8" holes to perforate the area to be removed. 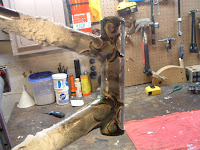 Moving around the lug, more large chunks of metal to remove. 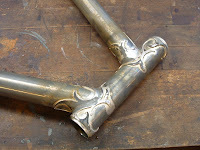 You'll see on some of the lugs, I started with a design roughly drawn on the lugs, but I deviated on some of them. Chalk it up to inspiration. The beginnings of a design. 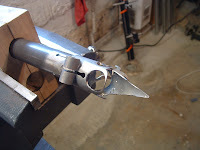 Removed a chunk and thinned down the center. 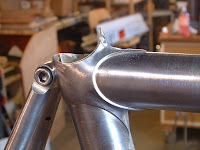 I have to give credit to J.P. Weigle for the large loops on the back of this lug and the underside spoon of the other lugs. 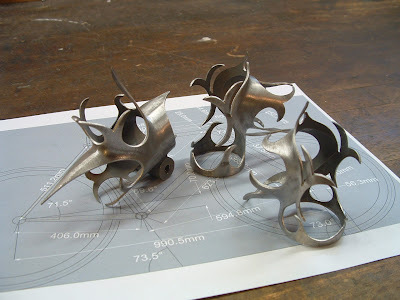 I saw his design on Kirk Pacenti's site and always liked it. 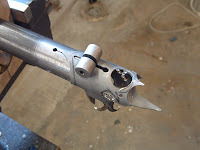 Moving on to the sides, cleaning out the large loopy openings with the die grinder. 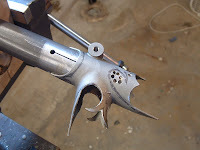 The finished lug. Admittedly I missed a couple steps, but you get the idea. On to the head lug, I'm already pretty well into the carving here, but pretty similar to the seat lug in the early stages. 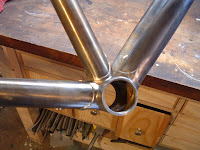 A shot from the down tube side, just beginning to take shape. 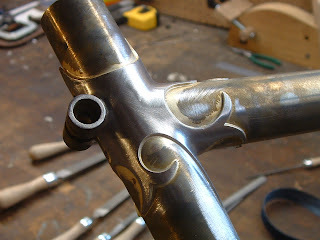 Finally, the finished lug set. 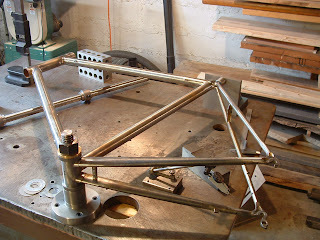 More pictures to come of the frame taking shape. 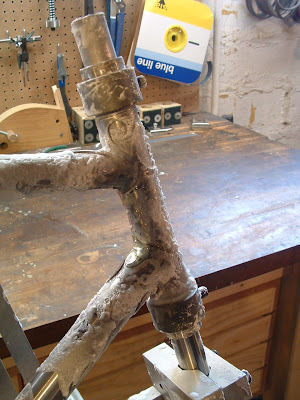 The pictures on the left are post braze, pre-finish and the ones on the right are finished ready to paint. 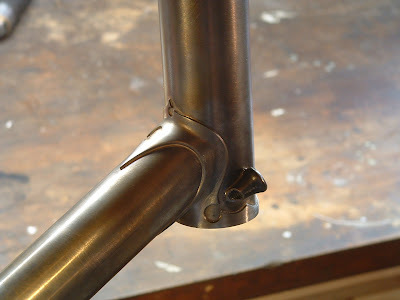 The lower head lug, I included another picture later with the STI guides brazed on. 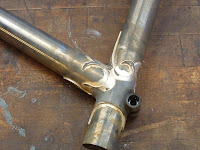 The seat lug, a little rough after brazing, but cleaned up nice. 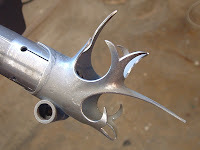 Henrik wanted the fastback style seat stay attachment, reminded me of my Serotta days. Here's the real test, is it straight? It needed a little gentle persuasion, but came around just fine. 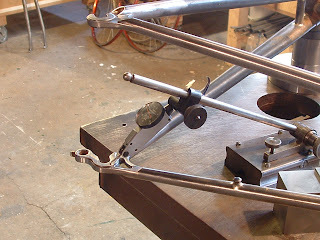 Here's the super accurate rear end alignment, worked just like I'd hoped. 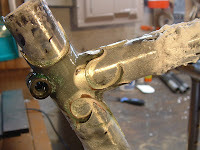 Just check the drive side dropout with the indicator then check the spacing with a caliper. 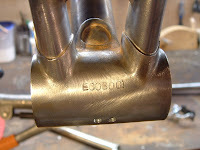 That's EC (Ellis Cycles) 08, for 2008 and frame #001. Also a cool shot of the dropouts. 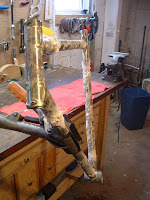 Finally, the head tube is faced and the STI guides brazed on.